Select a numerical value input field to switch to Japanese input. Then, I exit from the input state. I press something key in the 3D view. Click on the numeric input part. Then input column is funny. Clumsy it is not sorry in English. Ryota Shii (UNANA) raised the priority of this task from to Needs Triage by Developer. Ryota Shii (UNANA) claimed this task. Ryota Shii (UNANA) added a project: BF Blender. Ryota Shii (UNANA) set Type to Bug. Ryota Shii (UNANA) added a subscriber: Ryota Shii (UNANA). Sounds like an issue with the new IME code for windows? Severin, do you have a way to check that (i.e. win machine with some Eastern locale installed)? Tamito, you may be able to help here too? @Ryota Shii (UNANA) afaik, there are several different IME engines on windows, and only a few are compatible with Blender currently (see blender 2.73 release notes), can you please check and report which one you are using? Bastien Montagne (mont29) removed Ryota Shii (UNANA) as the assignee of this task. Bastien Montagne (mont29) added projects: Platform: Windows, User Interface. Tamito Kajiyama (kjym3) added subscribers: Dun Liang (randon), xueke pei (yuzukyo), Leon Cheung (leon_cheung). The reported problem was confirmed under 64-bit Windows 7 with the Microsoft Japanese IME and Blender 2.73. 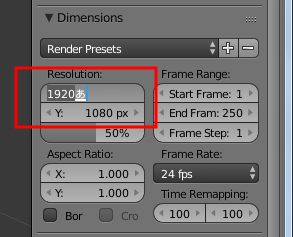 Click a numerical slider in the middle (e.g., Resolution X in the Render property window) so that it accepts typed numbers and letters. Now move the mouse cursor and type some key (e.g., A). Go back to the numerical slider and click it in the middle again so that it accepts keyboard input. At this point of time, the slider will show the numbers followed by the candidate character corresponding to the letter typed in the 3D view (see the screen capture below). Move the mouse cursor back to the 3D view and click somewhere in the background, and Blender terminates abnormally. @xueke pei (yuzukyo), @Leon Cheung (leon_cheung), @Dun Liang (randon) or any other Chinese IME users, could you guys also confirm the reported problem with Chinese IMEs? Please, feel free to add more testers. This comment was removed by Tamito Kajiyama (kjym3). Yes, typing asian characters accidentally in numerical slider will crash blender, tested in Windows 7 64bit, with Chinese IME. Julian Eisel (Severin) renamed this task from Japanese input Fatal bug to Using IME with number buttons leads to crash. IME should be disabled in those cases anyway, I think? Yeah, maybe that's already the best solution. Would also like to see why it crashes though. @Bastien Montagne (mont29) I use Microsoft Office IME 2010. I can reproduce this bug, it is a severe bug, I'm going to find out the problem and release a patch ASAP. Confirm this issue， windows 8 64bit ,and many chinese IMEs all fails, when not do confirm charactor input into the form and mouse click other place，Blender will crash，this problem was too unusual to find out. It appears the UI release IME code(wm_window.c:1543, function wm_window_IME_end) is running ahead of the wm event process code (wm_event_system.c:3415), a simple if can fixes the bug. Julian Eisel (Severin) closed this task as Resolved. Thanks for the patch @Dun Liang (randon)! Thank you guys! Really nice to see the collaborative testing and fixes!